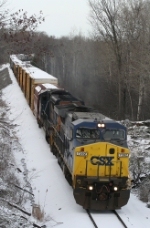 Description: CSX train at NR Jct in the evening taken from the north side of tracks. Rare photo op!! Description: CSX Dash 8 prepares to move south as a Union Pacific SD70ACe comes in from the bridge. Description: CSX stack train turns south. Description: Pair of CSX Dash 8's wait for signal at the main junction south of downtown Memphis. Description: Southbound freight out of Riverside Yard. Description: CSX B75324 heads south.